Welcome to The Jolly Fisherman, Craster. Combining stunning sea views with delicious home cooking and beautifully kept ales, this is a tastefully refurbished pub with tradition and character at its heart. We’ve taken great care to retain the charm of this historic pub with stone flagged floors, low beamed ceilings and comfortable seating. In the winter months, you can relax by one of our roaring open fires and in the summer enjoy the view from one of the most spectacular beer gardens in Northumberland. 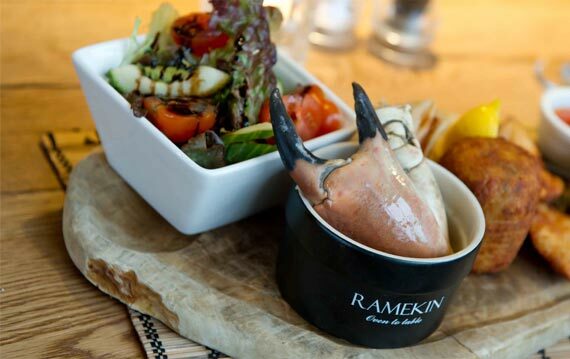 At The Jolly Fisherman you will find a wide selection of fresh catches on the menu, including our famous crab soup. We’re not just the home of delicious seafood though. 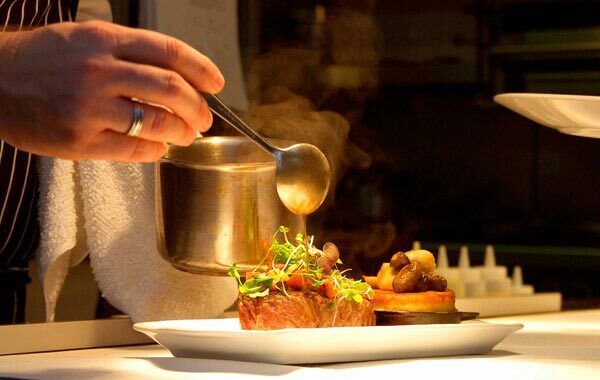 From rib eye steak to confit of duck, our chefs take pride in all our freshly cooked offerings. We carefully source the best produce from local suppliers including vegetables from Deli Fresh, meat from Butterworth’s, artisan breads by Running Fox, fish from Frank Round and delicious fresh crab from Lindisfarne Seafoods of North Shields. Kevin was classically French trained at the Naval & Military Club, Piccadilly, London, serving Royalty & Government Diplomats. After his apprenticeship he worked in prestigious restaurants around the West End, including Mortons Club, Berkley Square, where he achieved 3 Rosettes and onto Soho’s iconic Lindsay House achieving 3 Rosettes and 1 Michelin Star. Moving onto his own restaurant “The Yacht Club” at St Katherine’s Dock. Kevin’s food is described as London food in North East portions. Classic dishes with an eclectic twist. After returning to the area with his family he has acted as Consultant Chef to top Outlets in the North East & Yorkshire. He is looking forward to the challenge of the Award Winning Jolly Fisherman taking its offering to greater heights. You can be assured of a great pint of real ale at The Jolly Fisherman. 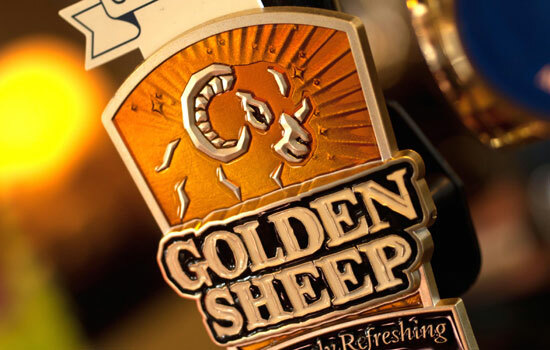 Our regular cask beers, Workie Ticket and Black Sheep, stand alongside specially selected monthly guest ales. If real ale isn’t your thing, you can be assured we have a full fine wine menu as well as all the other usual bar favourites. The Jolly Fisherman was established by Charles Archbold in 1847. Over the past 165 years the building has grown in both size and reputation and is popular with locals, coastal ramblers and day-trippers alike. Following a full refurbishment in 2012 new publican David Whitehead and his team are proud to continue and enhance the rich culinary heritage of one of Northumberland’s most iconic destinations. The picturesque Northumberland fishing harbour of Craster stands a mile and a half from the imposing ruins of Dunstanburgh Castle. Here at the Jolly, we’d recommend trying a ‘Craster kipper’ at the historic Robson & Sons smoke house; eating a slice of home made cake at The Shoreline Café, browsing the art at The Mick Oxley Gallery and pitching your tent at the nearby Dunstan Hill campsite. This beautiful stone fisherman's cottage sleeps four (plus cots). With wonderful views of the harbour it is a perfect base for couples or small families wishing to explore this beautiful stretch of Northumberland coastline. Driftwood is stylishly furnished throughout and boasts a private garden for summertime alfresco dining and a stone fireplace and wood burner for cosy winter evenings. For more detail on this cottage visit the stay craster website. Click here. Luxurious, double fronted, stone fisherman's cottage with beautiful views of the harbour. Stylish contemporary interiors with a coastal flavour, full of country-style chic, all with masses of original features, pretty painted furniture and beautiful soft furnishings. This cottage is well suited to family get-togethers or groups of friends looking to explore the Northumberland coast. This Holiday apartment in heart of Craster village with stunning sea views. The apartment sleeps up to four in 2 bedrooms, ideal for couples or small family wanting to holiday in a small fishing village with big views, a castle and a smokery. Log burner, wi-fi, accepts children & pets. Exclusive discounts apply for our guests. The apartment sleeps up to four in 2 bedrooms, and benefits from up-to-the-minute heating & sound insulation, double glazing and superb crafting to reclaim original architectural features and create new ones like the lovely round porthole window and feature plaster work molding beautifully into the original stone walls. The property has a wood burner and wi-fi, but its best feature is its location about 100 yards from the harbour, a mile stroll along the Heritage Coastal Walk to the North is Dunstanburgh Castle and the beautiful stretches of sandy beach beyond, and you can even make use of the owner's cafe downstairs for ready made breakfasts and brunch or their pub down the road for superb evening meals. Exclusive discounts apply for our guests. Craster is situated on the Northumberland coast, to the North East of Alnwick. From the A1 take the B1340 before turning right onto Windyside Hill. Follow this road until you reach Craster village. Further detailed directions can be obtained online or via sat nav using The Jolly Fisherman’s postcode: NE66 3TR. Craster is a popular destination with coastal walkers. See the AA Guide here for full information.